Michael Gapen, chief U.S. economist for Barclays Capital, told the Wall Street Journal last month, “We think U.S. growth may have just peaked.” He expects both consumer and government spending to downshift in the days ahead. Meanwhile, analysts are issuing endless warnings about “peak earnings,” and the majority of investors now also believe that 2018 is a “peak year” for stocks. We all know what follows a peak! These are the days where a Wall Street wager looks a lot like the “slot odds” at Circus Circus – without the free drinks of course! This is NOT the time to gamble with your retirement savings. Instead of counting cards, start counting benefits! What if the Fed can’t help us? There’s a lot of talk of an imminent economic slowdown. The recession timeline estimates range from the second half of next year to the third quarter of 2020. And there’s even greater concern that the Fed is tapped out from propping up the economy during the last recession and doesn’t have enough ammo left to pull us back from the brink in the coming months. Don’t forget, interest rates are STILL historically low, and the national debt is STILL historically high! This leaves the Fed with nowhere to go! For many Americans, the size of their nest egg is contingent on the “good times” continuing to roll along. Recurring stock market record highs have helped produce legions of paper millionaires. The market has single-handedly fattened IRA accounts, beefed up 401(k)s, and pumped up home prices. The market can also single-handedly flatten IRA accounts, turn 401(k)s into 201(k)s, and deflate home prices, just like in the last two crashes we’ve had since 2000. Violent price swings are a sign of RISK, and “white-knuckling it” is not a plan. 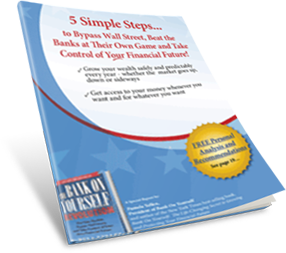 Bank On Yourself can help you accumulate wealth safely and consistently – no matter what’s happening in the economy or the stock market – unlike the brokerage houses, big banks, and the rigged dice joints where the odds are strategically stacked against you. Request a FREE Analysis here right now to take the next step to Banking On Yourself. The only regret most people say they have about Bank On Yourself is that they didn’t know about it during the last economic crisis and stock market crash. Yes, October was one of the most volatile months on Wall Street in 118 years, but Bank On Yourself has never had even a losing month in over 160 years. Your peace of mind and retirement security depend upon what you do NEXT! Request your free Analysis now – while it’s fresh on your mind – and find out how adding the Bank On Yourself strategy to your financial plan can help you reach your financial goals and dreams – without taking any unnecessary risks.